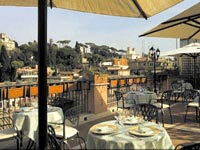 Thirteen Things to do in Rome. 10… Run down this staircase out of the Vatican museum. There’s usually one pic that I love from every holiday… and this is the Roman one. 13… And on the final morning, you must get soaked to the skin and have to get on the plane home uncomfortably damp. I so want to go to Rome right now. I ENVY YOU! 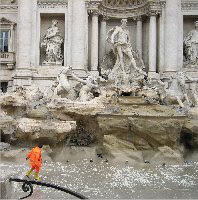 Love the Photos of Rome, Kim! Beautiful. I’m hoping to visit Europe in five years for our tenth anniversary. I love the architecture! I love Rome. I hope to go back someday..
Rome looks gorgeous! There are so many places I want to travel to, and this is one of them! Impworks – never found those stairs. Wow, very cool list! I love the staircase photo and… well, all of it! I’d love to visit Rome someday. great photos…must have been a great vacation. Love #9. Oh man, I wanna go. I just got done helping my daughter do a travel brochure of Italy for school. This is just rubbing it in. I’m loving that golden skeleton. creepy yet oddly satisfying. Stunning, stunning and I am jealous, jealous! wow, what a great trip it looks like! you take great pictures! i am bugging hubby to go there soon. happy tt! Fabulous pictures. I sure hope to make it there myself one day! Your hotel looks beautiful and I love the staircase pic! Wow…I’m so jealous!!! Gotta plan a trip soon! Beautiful pics…thanks for sharing!! I’d love to visit Italy some day! 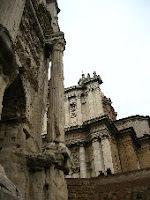 I would love to visit Rome, but probably will never get the chance – that is, unless my husband winds the lottery. LOL! Oh I loved Rome. I have been there twice — not long enough either time. Thanks for posting the pictures. My TT is also posted – 13 activities I like. I have not been to Rome…I was thinking it was all about the food! Wonderful pictures and comments with each. 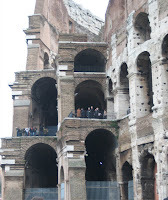 I enjoyed my tour of Rome. #10 IS gorgeous! Great shot! I’d love to go to Rome. Happy TT, mines up! Sounds like a wonderful vacation. Good luck with the kiddie germs… I know how that can be! Your staircase photo is beautiful. Thank you for sharing. That staircase is stunning. There are two similar to it hidden in the old part of Liverpool University Guild of Students but not as well kept or used. Rome looks like a great place to visit! Maybe I’ll get there someday! Happy TT!